For those that are looking for the manual, the Quick Reference Card files or files on the merchandise for the Hexar: it's all at the bottom of this page. Come back to read later, there's more Hexar goodies in the text! The most extensive review on the Hexar AF is the one by Richard Caruana on Photo.net. This review has a HUGE list of follow-up posts from numerous users, sharing all kinds of tips an tricks on the Hexar. And, somewhere in there used to be a table with button pushes to enable the Silent Mode on Hexars that come without it. Oh yeah, sorry. The Hexar, being a small and silent camera as it is, can work even more stealthily when you keep a button pushed while switching it on, to engage Silent Mode. Silent Mode was a feature found in the first incarnation of the Hexar, the Black Edition. 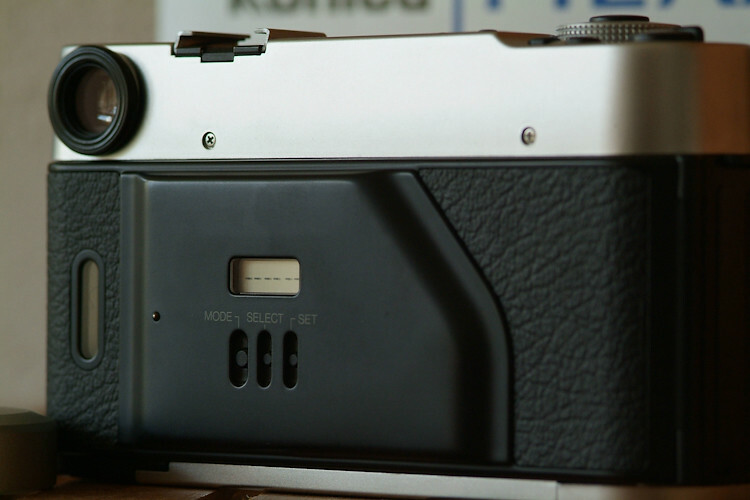 When starting series two, The Classic Edition, Konica had to abandon the Silent Mode, apparently it was a patent infringement of some kind. (No other company ever produced a Silent Mode camera, so whose patent was it?) For years, there were several editions without Silent Mode. You had The Rhodium Edition, The Gold Edition, The Titanium Edition (Europe only and fairly unknown, 1,000 made, shown above is number 945), and The Silver Edition. All without Silent Mode. 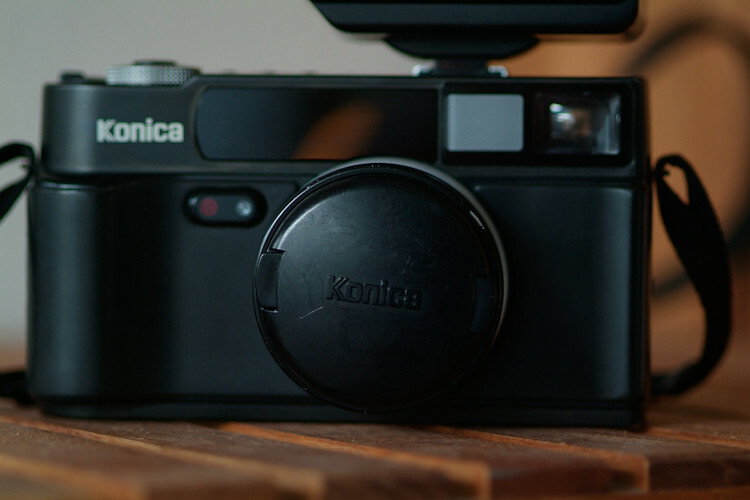 But, at the bottom of this page you can find a write-up showing what the proper actions are to get Silent Mode going in all those cameras, since Konica never removed it from the cameras, but just did not enable it in the software with any post-Black Edition models. Thank you, Konica! 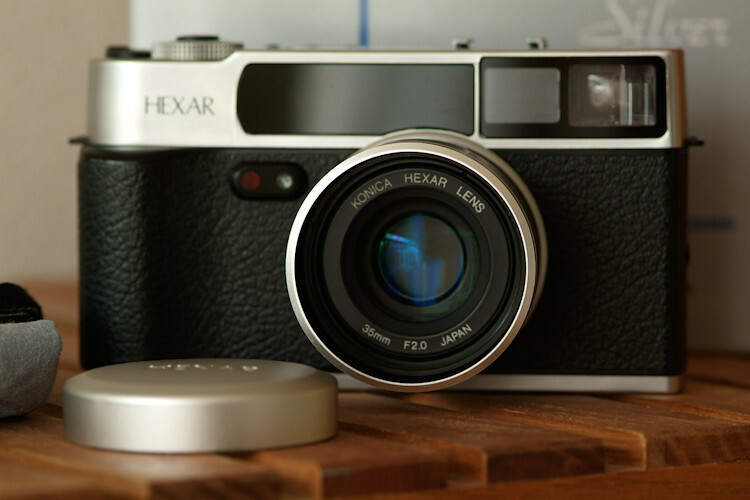 The Hexar is an AutoFocus camera. It can be set manually (and sometimes really should, read below), but the AF on the camera is too good to be true for a Point and Shoot camera, since it has a 290 step AF. That's right boys and girls, from closest distance to infinity is 290 steps with the Hexar! And better still, the AF system is an InfraRed based system. IR-focusing is what the AF cameras started out with. The principle involved is that of triangulation: one diode emits the IR beam, another one picks its reflection up. The exact distance of the subject to focus on then can be calculated with a simple formula since the distance between both diodes is a fixed one. (The image of the Hexar Titanium above was shot with a Leica M8 without IR-cut filter, so you can see the diodes through their plastic cover plate, cool!) 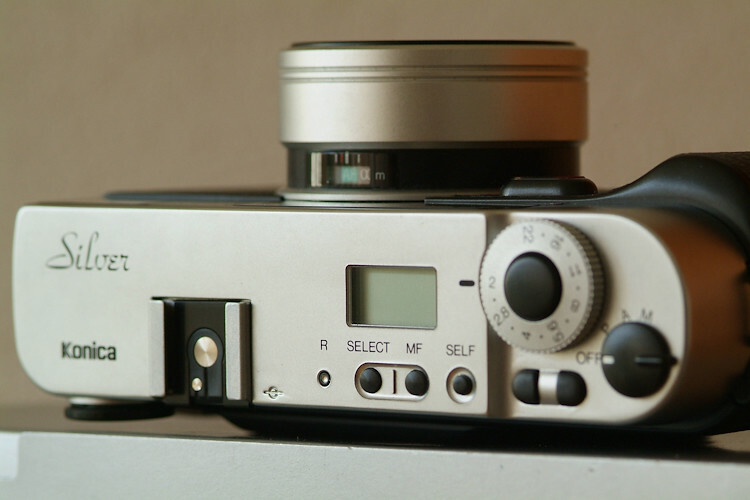 Modern cameras measure distance through the lens and scan for optimal contrast in the subject to focus on. Which in essence is nice, but when there's not much light, you're out of luck. Since the moderen day camera cannot 'see' without light, a subject illumination light is added on the body. Nikon DSLRs had it and it annoyed the hell out of me, whenever there was too little light to focus, the darn light would come on and your stealth cover was blown instantly. Valkenburg NL, cave. Shot with Hexar AF with flash, Kodak E100G. 2008. 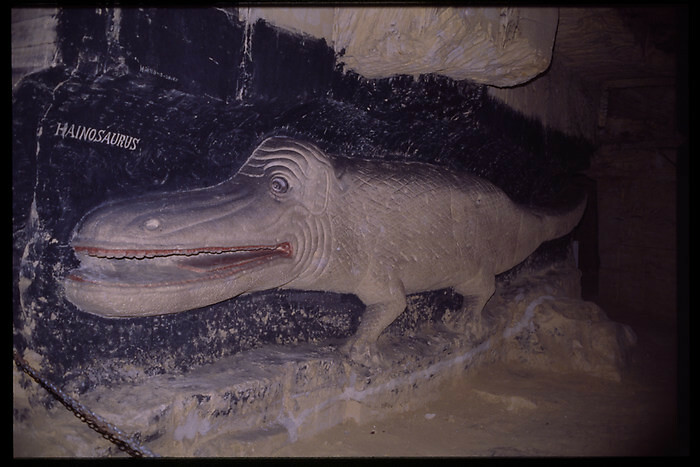 Sandstone wall carving of a non-existent 6 meter long dinosaur, dated around 1880. Only trouble with the InfraRed focusing on the Hexar AF is, the IR beam is also reflecting off glass surfaces. So, when shooting through a window, make sure you guesstimate the distance first and set it manually, or the camera will not focus correctly! On using flash with the Hexar: If you cannot get hold of the Hexar HX14 flash, you can either use the HX18w that is dedicated for the Hexar RF (and similarly hard to find), or use any Nikon flash since the camera can communicate with the Nikon flashes without any trouble. The Nikon SB-30 is a nice and compact flash that resembles the HX18w and will not make your Hexar topple over with a bulky SB-something. 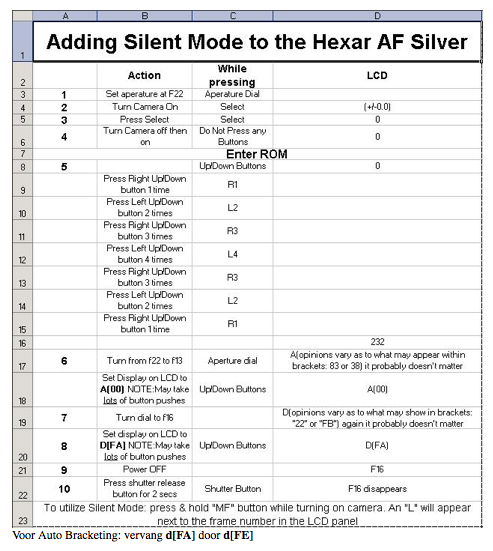 Easy Hexar tips and tricks section, including programming the Silent Mode and Auto Bracketing! 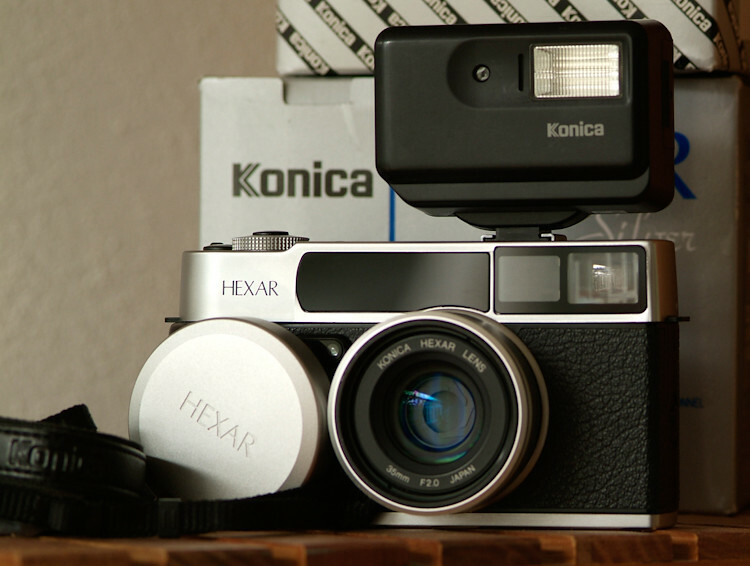 The much-wanted Silent Mode is present in all Konica Hexar AF camera's. 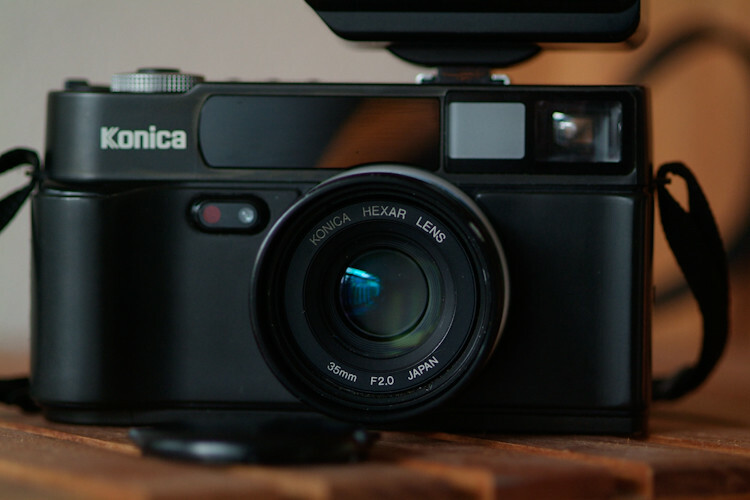 The original black camera's had it enabled in the factory but in any other model, you can enable it yourself. Here is what you do! 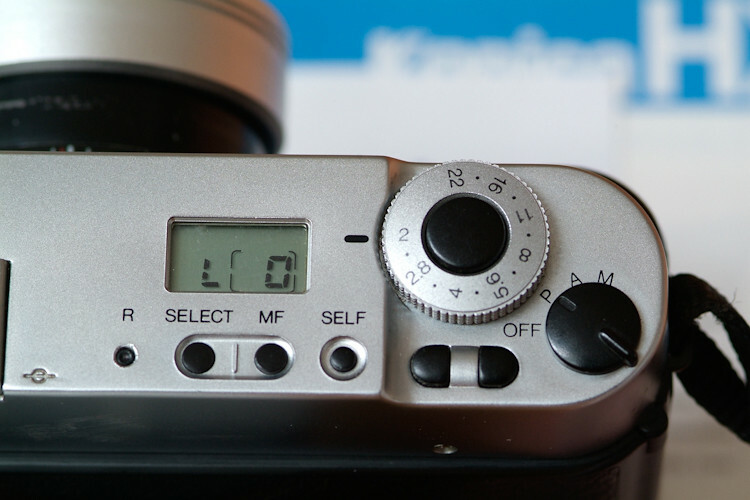 1: With camera off and no film loaded, turn the aperture dial to F22. 2: Switch the camera on and press the SELECT button. The LCD display will show +/-0.0. 3: Press the SELECT button again. The LCD display will show . 4: Switch the camera off, then back on again. Do not press any buttons. LCD Display shows . The camera will respond by cycling its focus and the display will show the flashing number '232'. 8: Set this value to D[FA] with the exposure compensation button. 9: Power off. The display shows f16. 10: Press shutter release button for 2 secs. f16 disappears, camera switches off. There you have it, now your camera has Silent Mode enabled! Automated Exposure Bracketing, how to enable it? just follow the steps as listed above. At step 8, instead of setting D[FA] set D[FE]. 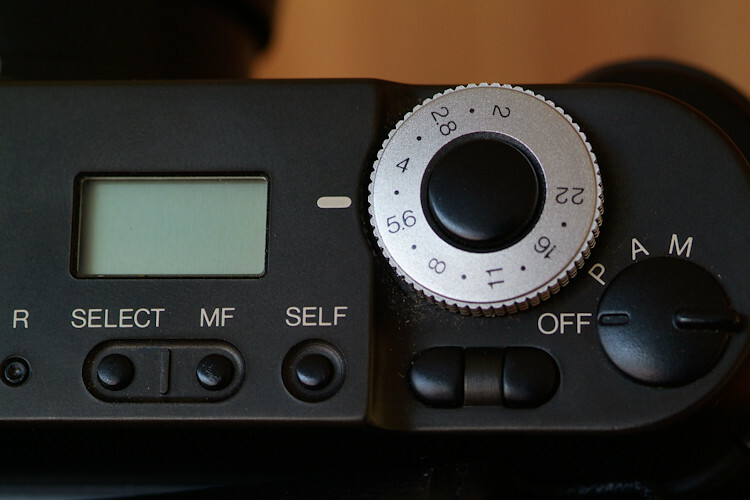 Power off, then hold the shutter release as described with the listing. You should then get AE-Bracketing, manual guide number setting as well as all the extra Hexar Classic features. Easy as pie! •when releasing SELECT, camera displays [PFl]. •switch to Off, and the selection is deleted. •when required GN number is not available, select nearest lower number, e,g. GN24 not available, then select GN23. •with each exposure, the left number increases, e.g. 1, 2 etc..
•switch to Off, and the film is transported to the next frame. •more than 9 exposures are possible, but not indicated. •When focusing close with a filter on, the camera sometimes produces an error. This happens when the front lens element jams up on the filter. •Remove the filter and the battery. Leave the camera without battery for a few hours. It should re-set. •Konica used to offer service fitting a spacer on the filter ring, but this service was not provided by any other company. Luckily, you can fix it yourself. •Find yourself another 46mm filter, wrap it up in a towel and knock out the glass. •Use the empty filter ring as a spacer, adding the filter on top. 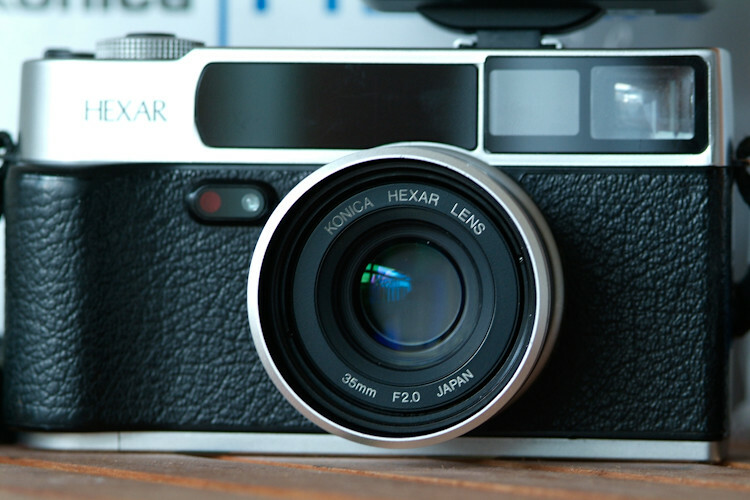 •If you make a habit of shooting different cameras, you can easily locate your Hexar negatives. Hexar ngatives have a little, sharp pointed notch on the bottom left side. 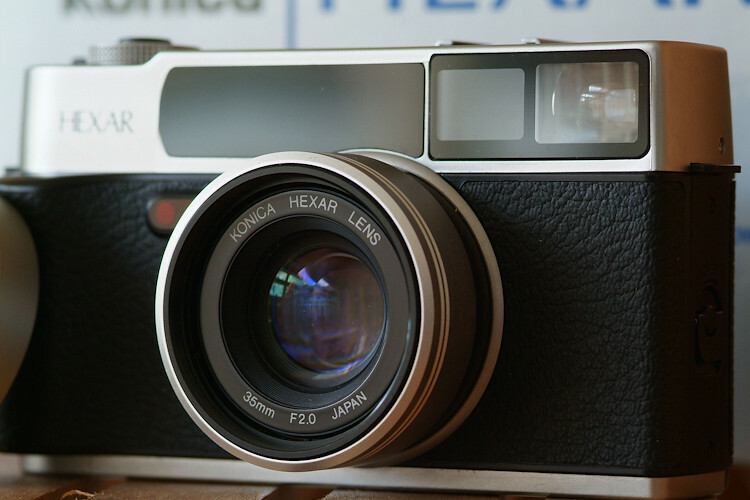 The only other cameras that have a similar feature are the Agfa Optima Sensor xx35 series cameras. •switch to M-mode and press SELECT until [+/- 0.0] is shown. •use UP/DOWN to select increment, from 1/3 to 2 stops. •when pressing shutter release, three exposures are taken. •though engaged in M-mode, switching to A or P is possible before pressing shutter release. •bracketing varies shutter release time. When in P-mode this is outside of the range 1/250 - camera shake critical speed, the aperture is changed. •autofocus is activated before the first exposure and maintained for second and third. •shutter release time indication shown in A or P mode is only calculated for the first exposure. Under low light conditions, the shutter time may end up under the camera shake critical speed. When in doubt use a tripod. •when the aperture/shutter time combination falls entirely out of the range of the Hexar, the exposure is not made. This results in only 1 or 2 exposures. •when the film is full, the bracketing is stopped, and the film gets rewinded. •when using bracketing together with EV-compensation in A or P mode, the entire bracket moves up or down the amount of the compensation. 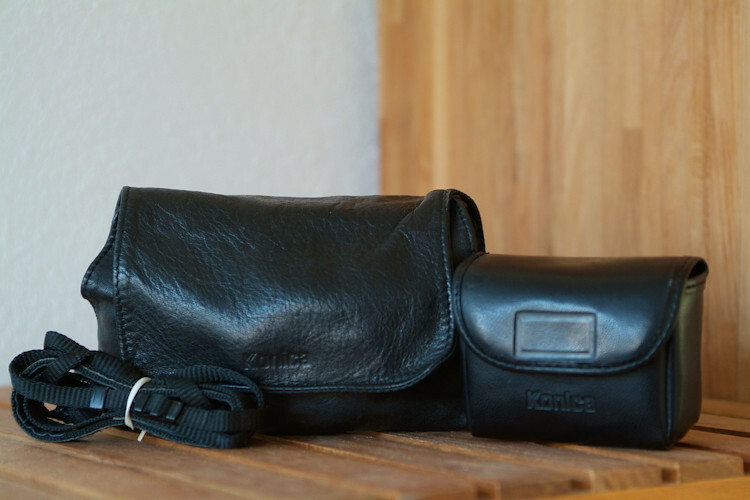 •no bracketing is possible with flash or T(time) exposures. •bracketing has to be cancelled by setting the EV to [+/-0.0] again. •partially press shutter release button. •display shows proper shutter time. •press UP or DOWN, and that time is selected. This allows for a very quick spotmetering. When now the composition is changed, including aperture/DOF, the measured time still is used. •Apparently, Domke 1 inch Gripper straps are small enough to fit the tiny Hexar lug holes. However, I have no certainty on this, so check with a seller before buying! 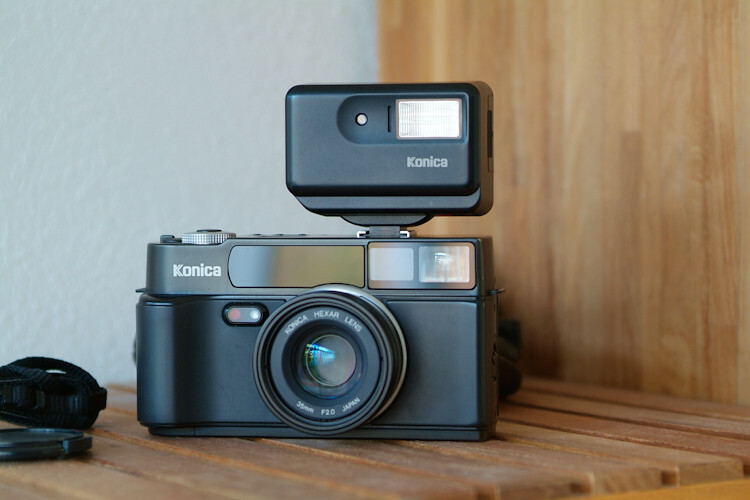 •IR film is non DX, so requires pressing the shutter release button to advance to frame 1. •after 3 secs, the display will show [iso 100], acknowledging successful setting of IR value. •for correct exposure, consult the data sheet of the film. 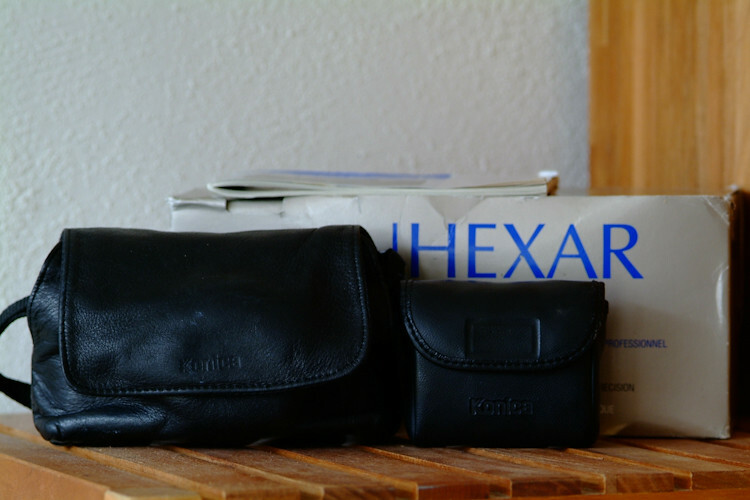 The best fill flash system ever made was in the Konica Hexar AF! The camera takes two exposure readings in P mode - one for the background measured by ambient light, and one for flash, measured by focused-subject distance. The cameras built-in exposure calculator knows how to balance these. Nifty! The Hexar AF is a sturdy little beast. Follow the link to read what Davidde Stella did to his Hexar, and what it was like after that. 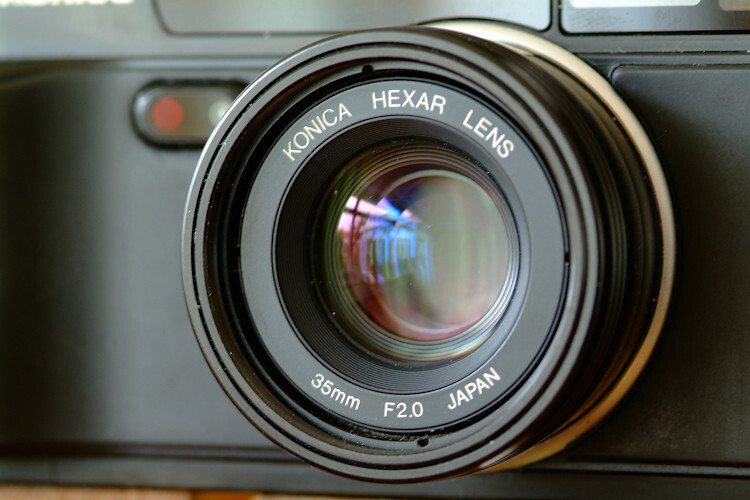 Bellamy of Japan Camera Hunter sure has some pretty pictures of Hexars up on the website! The Hexar AF manual in PDF is linked to here. PDF file. It's for a Silver type camera but is identical for other types. The Wikipedia page on the Hexar AF. Shutter button troubles? Check this thread on the Rangefinderforum to fix it yourself! An alternative manual by fellow Dutchman Frank van der Wiel here. PDF file. Want to know if the Silent Mode is really worth the hassle of programming it? And some more shots for you to enjoy! All from my private collection of Hexar camera shots!